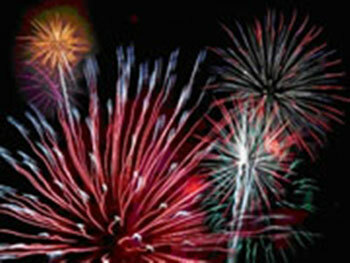 Summer starts with a bang with East Jordan's Freedom Festival. With food, music, fun, entertainment, carnival, dancing, and more, the Festival is packed with activities for the entire family. Grab a blanket, a lawn chair, family, friends, neighbors or co-workers, and head to the Adult Softball Field (across from Marty’s Cones & Carry-Out) to enjoy a FREE outdoor movie. Come down early, stake your ground and have some fun. Movie will begin at sundown (around 9:30 pm) and will be shown under the stars on a huge, inflatable screen with a state-of-the-art projection and sound system. The movie is free and family- friendly. Pick-a-Duck, Treasures in the Saw Dust, Bean Bag Toss and more. There will be bubbles to blow, sidewalks to chalk, face painting, wash out hair color and much more. Twister Joe, Balloon Artist Extraordinaire will be there to create balloon animals and balloon hats for everyone. Schmidt Amusements offering exciting midway entertainment for young and old alike. This year’s Block Party the Theme for the night will be "Let Freedom Ring." Live Music, Food, Games, The Michigan Stilt Walker will be on hand to make balloon creations and lots more. This year we will celebrate the "Cartoon Characters – Let Freedom Ring'. Build a float, decorate your bike or wagon, dress up in costume and join the fun. The Parade will begin in the Marina parking lot and head north to Main Street and up to Williams Street down the hill to Spring Street and back to Memorial Park. Back by popular demand! Memorial Park will be filled with craft vendors of all kinds. Stop down and do some shopping before the Grand Parade. This tournament is an excellent way for both boys and girls teams to have fun playing basketball in a friendly yet competitive environment. Divisions are determined by the grade students just completed, based on the oldest player. Make plans to head to Murphy’s Field where the kids can play in two Bounce Houses. There will be no charge to enter. Murphy’s Field. Let the kids meet and pet Maddie’s farm friends from White Birch Valley Farms. If it’s Floats, Beauty Queens, Fire Trucks, Bands and Fun you’re looking for then the Freedom Festival Grand Parade is the place for you. You will have a chance to win over 40 prizes that have been graciously donated by area businesses and individuals. The prizes range from works of art to gift certificates and everything in between. You must be present to win. Drawings will take place throughout the Lip Sync Contest. Dress up, choreograph a dance or just mouth the words, but most of all have fun and try to win the cash prize. Song choice must be approved prior to the event. Tickets will be on sale during the festival at the Freedom Festival Information Booth or from any Festival Board Member. No festival would be complete without a grand finale of Fabulous Fireworks and the East Jordan Freedom Festival has just that. Launched from a barge in the middle of the Beautiful South Arm of Lake Charlevoix and synchronized to music, you won’t soon forget this fireworks display. The best viewing location is downtown East Jordan in Memorial Park, The Marina Docks, The Old Boat Launch and Bridge Area. Memorial Park will also be the best location to hear the music that will accompany the beautiful fireworks display. Held at the Sno-Mobilers Club House on Mt. Bliss Road in East Jordan.